I’m proud to report that legislative advocacy continues to be an important activity at PSAR. Advocacy plays a critical role in supporting property ownership throughout our communities. A powerful alliance can be formed with other REALTORS® and affiliates when we speak in solidarity with one voice and work together with elected officials to protect and promote homeownership and property investment. The result can be public policies that uphold private property rights and build strong communities with a vibrant business environment and free enterprise system. Indeed, whether or not your clients know it, or the average homeowner realizes it, government relations can influence the price of real estate and affect the state of the economy, level of interest rates and nature of demographics, along with a host of other variables that can ultimately determine a property’s value. Currently, a number of PSAR members are preparing to travel to Sacramento on May 1 for the California Association of REALTORS® (C.A.R.) Legislative Day 2019. 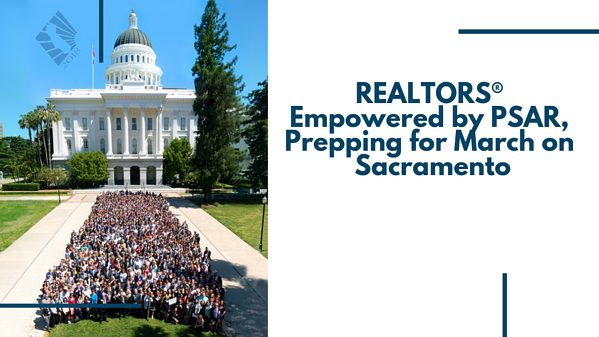 The event, the 47th annual, will include opportunities to meet and discuss real estate issues directly with state legislators and their staff members, as well as hear from California’s political leaders and the leadership of the state association. As a follow-up to C.A.R.’s Legislative Day, several Association members also are planning to attend the upcoming National Association of REALTORS® (NAR) 2019 Legislative Meetings and Trade Expo, May 15 in Washington, D.C. NAR is widely considered one of the most effective advocacy organizations in the country. I am very proud to say that the majority of attendees to Sacramento and the nation’s capital will be committed and dedicated members of PSAR’s Governmental Affairs Committee (GAC). The GAC focuses on all things governmental and how public policy can affect real estate issues. In it is role as an advisory committee to the PSAR board, the GAC provides a forum for political advocacy and policy discussion. GAC members are diligent in keeping track of proposed city and county ordinances that could have a potential impact on the local real estate industry. Their savvy political advocacy efforts have prevented the passage of detrimental laws that could have hurt PSAR members’ business activities. GAC members communicate with their local government officials to help stop government agencies from finding ways to tax and regulate real estate transactions. Statewide, it’s an incredibly busy year because our real estate industry has emerged as a major player in the current legislative agenda. The California Association of REALTORS® (C.A.R.) recently announced its recommendations for the 2019 legislative session, including bills that address California’s housing shortage through increasing supply and removing barriers to development. C.A.R. said it stands ready to work with Gov. Gavin Newsom, the Legislature and key stakeholders during the 2109 legislative session to advance innovative solutions to ensure all Californians can realize the American dream of homeownership. -- SB 50 (Sen. Scott Wiener) Housing Development Around Transit: Boosts housing and apartment development in and around major transit hubs and employers, and provides developers with a “density bonus,” or authority to build additional units in exchange for building below-market units, and other incentives or concessions. -- AB 1568 (Asm. Kevin McCarty) Housing Accountability: Holds local governments accountable by withholding gas tax revenue if counties do not meet home building benchmarks verified by the California Department of Housing and Community Development. -- AB 1074 (Asm. Tyler Diep) Accessory Dwelling Units: Increases housing supply by selling bonds to provide loans to homeowners to construct accessory dwelling units (ADUs). -- AB 1020 (Asm. Jacqui Irwin) State Housing Agency: Establishes a state Housing Agency with a cabinet-level Secretary of Housing to oversee all housing-related initiatives and activities throughout the State of California. -- SB 509 (Sen. Anthony Portantino) Affordable Housing License Plate Program: Establishes a housing crisis awareness program through the issuance of aspecialty license plate by the California Department of Motor Vehicles. The license plate would generate revenues for affordable housing programs throughout the state. These measures, along with other bills that C.A.R. is supporting this year, are intended to increase housing construction as the solution to California’s housing shortage. 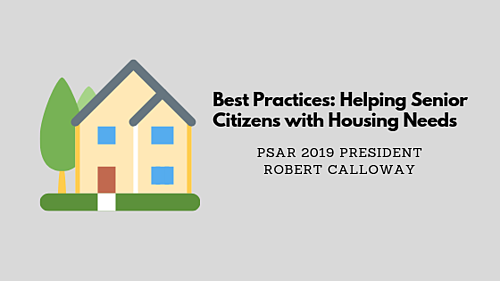 You can be assured that PSAR remains committed to reaching out to elected officials, motivating and mobilizing the real estate community and keeping our members involved and informed about legislative issues in an effort to protect private property rights and homeownership.